Cookie or cake? If I had to choose, I'd call it a cookie. 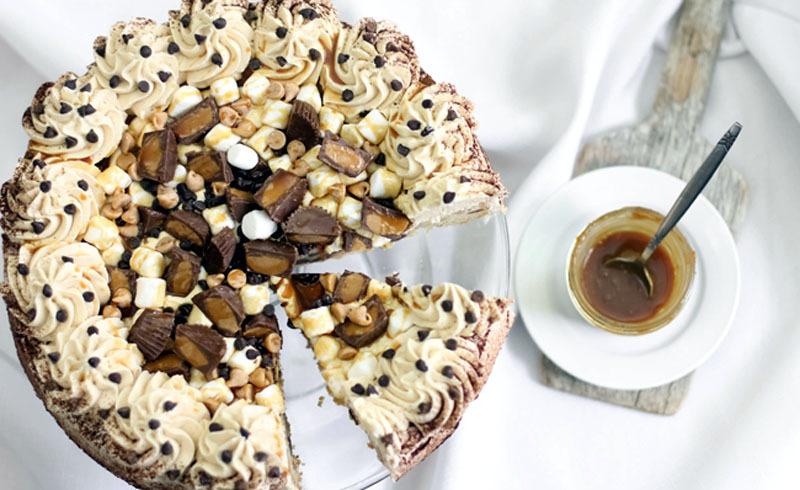 It's a great big fluffy chocolate and peanut butter chip cookie that's baked in a 10-inch pan, piled with marshmallows, caramel and peanut butter cups, then sliced up like cake. Cookie or cake? If I had to choose, I'd call it a cookie. 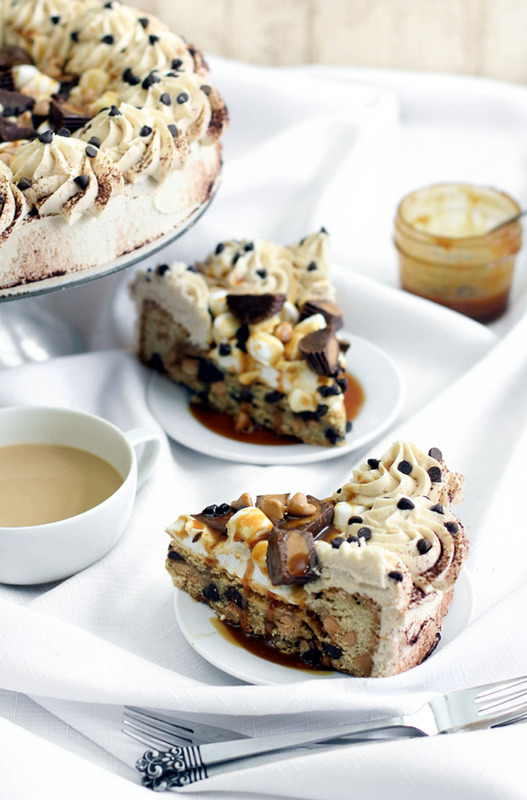 It's a great big fluffy chocolate and peanut butter chip cookie that's baked in a 10-inch pan, piled with marshmallows, caramel and peanut butter cups, then sliced up like cake. It's so good that when I woke this morning, I stumbled downstairs half asleep and ate a piece while standing at the dining room table. Preheat oven to 350° F. Grease a 10-inch cake pan with white vegetable shortening and line the bottom with a circle of parchment paper. Set aside. In a large bowl, beat together butter and both sugars until well combined. I used a stand mixer at medium speed, but you can also use a hand mixer at medium-low speed. Add in eggs and vanilla extract. Beat again until well mixed. In a separate medium bowl, whisk together the flour, salt, baking soda and cream of tartar. Pour flour mixture into the butter mixture and mix until a thick batter forms. Add chips and mix on the lowest setting until all the chips are evenly dispersed. Pour batter into the prepared pan and spread evenly with an off-set spatula. Bake for 20-25 minutes or until a toothpick tester comes out clean. Remove from oven and let cool in the pan for 10 minutes. Turn cake onto a wire rack and then again so that it's right side up on a serving plate or cake stand. Let cool completely. Combine the unsalted butter and peanut butter in a large bowl or the bowl of a stand mixer. Beat together until well blended. Add confectioners' sugar and salt. Beat until well incorporated. Mixture may be crumbly. Add milk or cream 1 tablespoon at a time and beat again until light and fluffy. Frost the sides of the cake (do not frost the top) and transfer the remaining frosting to a piping bag fitted with a large star tip. Pipe large swirls of frosting around the top edge of the cookie. Spray a small bowl with cooking spray and place the 1 cup marshmallow cream in the bowl. Heat gently in the microwave for 20-30 seconds, or until just loosened, then pour in the center of the cookie. Spread evenly over the top. Sprinkle marshmallows, chips and peanut butter cup halves over marshmallow cream. Top with caramel sauce.